11July 2016, Bonn Germany: The fourth NAP Expo is underway in Bonn Germany, bringing together over 200 delegates from across the world, to discuss how National Adaptation Plans can serve as the main vehicle for adaptation planning and implementation which in the long term achieve the global goal on adaptation. The particular focus for the NAP Expo 2016 is 'Advancing National Adaptation Plans post-Paris'. The fourth in the series, this year's NAP Expo includes keynotes on latest science and approaches on climate change adaptation, presentations from developing and developed countries and relevant experts on experiences, best practices and lessons learned, and information from relevant bodies, organizations and agencies on support for the formulation and implementation of NAPs. The NAP Expo 2016 is being held on UN Campus (11-12 July 2016) before the main event will take place ffrom 13-15 July 2016 in Beethovenhalle, Bonn. The NAP Expo is conducted annually by the LDC Expert Group (LEG) as a forum for developing countries to advance the process to formulate and implement National Adaptation Plans (NAPs). They are held in Bonn, and the LEG plans to hold regional NAP Expos in various regions as part of relevant regional events. The NAP-GSP, together with FAO, coordinated a parallel session 'Establishing baselines for NAPs and scaling up adaptation actions'. 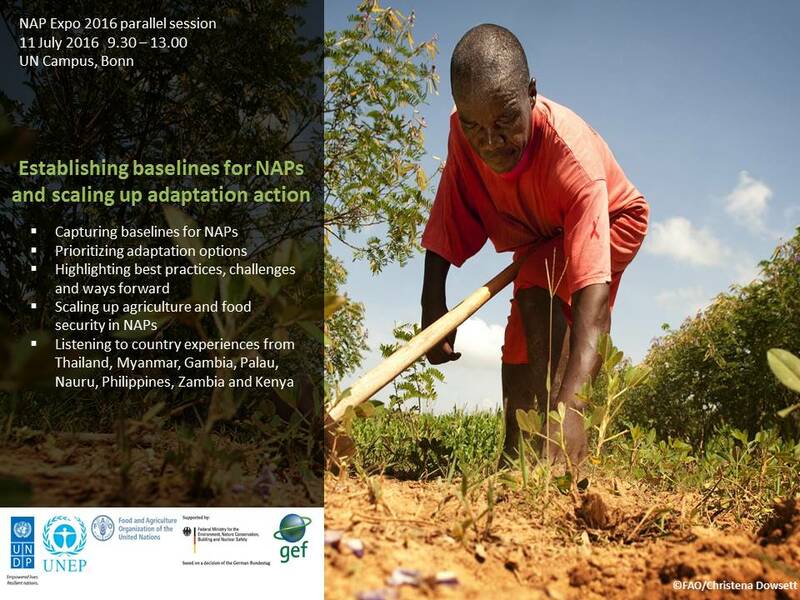 This parallel session, held during the NAP Expo 2016, provided a platform to share experiences from developing countries in identifying baselines for adaptation plans. It also considered the prioritizing and scaling up of adaptation interventions, particularly focusing on the agriculture sector.